Stanley, North Carolina is a small town, but one of the oldest in Gaston County, actually beginning in the early to middle 1700's. An elusive prospector named Stanley panned for gold in a creek that came to bear his name. Mr. Stanley left the area and his exact identity was lost to time, however, a community sprang up along the creek which became known as Stanley's Creek Community. During the Civil War years, the town's railroad depot, Brevard's Station, named for the original landowners, the Alexander Brevard family, was a major departure point for soldiers leaving for the war, and also for sending provisions to soldiers in the field. Click the Stanley sign or one of the tabs below to begin your journey through Stanley's history! Copies of this book are available for purchase. See the bottom of this page for details. Stanley, North Carolina actually had its beginning in the middle to late 1700’s when pioneers first began arriving in the wilderness of the Catawba River region. Some of the early settlers made their first homes along the banks of a small creek which emptied into a larger creek before reaching the river. This small creek was named Stanley’s for a gold prospector who had ventured into the territory and then moved on farther south. The congregation of settlers quickly began being referred to as the Stanley’s Creek Community. The Stanley’s Creek Community existed over one hundred years before incorporating as a town, and this is one of the oldest settlements in today’s Gaston County. Our town has remained one of the smaller towns in the county, but does not lack for historical significance. Over the years our area was visited by several prominent people; a botanist and adventurer, André Michaux; the British General Lord Cornwallis; Civil War General Stonewall Jackson who married a lady from near Stanley; and many others. However, the ingredient that gives our town the distinction of being a terrific place is the folks who have chosen to live here. A diverse group, from the original landowners who were the Native Americans, or the Catawba Indians, to the wealthy landowners, the merchants, the craftsmen such as blacksmiths, furniture makers, potters, saddle makers, etc., as well as the teachers, the preachers, the homemakers, the outlying farmers, the students, the gold miners, the athletes, the mill workers, to all just plain good folk, have made Stanley what it was in the past, what it is today and what it will be tomorrow. The recording of the History of Stanley was spurred by a poem written in 1989 by Sara H. Grissop. Town officials were inspired to form a committee to gather and record bits and pieces of information regarding Stanley’s past; and thus began the Stanley Historical Association. Many pictures have been included in our book, "Echoes and Shadows of Two Centuries, 1750 - 1950, The History of Stanley, North Carolina" as well as information taken from newspaper clippings that reported on instances as they happened, with an attempt to convey the type of life lived by our ancestors. Eight years of research and many trips to obtain information have been made. Every effort was given to document information and to record references used, though mistakes are inevitable when genealogy is involved, and for any error we apologize. The genealogy is presented in an effort to show readers how the early settlers can be connected to the people of today. Our small town of Stanley is growing with new development on the horizon. We know not what the future holds for us. But feel an ever increasing desire to record the history of our town, with a desire that the children of today and the children of the future will have knowledge of and take pride in this unique small town in which we live. Due to the help of all the people selected on the history committee to compile a book - Alfred Rhyne; Kathryn Shook Allen; Bill Smith; Butch Abernathy, Sara Grissop; and since Ralph Handsel was not able, we selected Joyce Joy Handsel to help us with our Stanley History Book. Bill Smith's wife, Betty Abernethy Smith, has also been a great asset, along with other residents we have compiled a history book, documenting many, many articles that has never been written, that's what a lot of research has uncovered. Many libraries and courthouses, also Raleigh Archives have been visited many times. Newspaper articles have been read and many deeds and wills have uncovered much history. A lot of history has been rediscovered by many citizens of Gaston County bringing in a lot of information on different families along with out-of-staters coming back to our area searching for their roots, who once lived and settled in our area. It's really gave us much knowledge and insight of former forefathers of our Stanley area. From Stanley Creek Post Office on Stanley Creek and moving to the newly developed village of Brevard Station come into being after Wilmington-Charlotte Railroad came through our area and now called Stanley it has been a tremendous experience and joy for Joyce Handsel and I, Sara Grissop, with the compilation of our Stanley area history. As a child, I heard my great aunt Essie Lay McGinnis refer to Stanley as the "Garden Spot" of the world, and now years and years later found some stationery of (former) Mayor Hubert Craig, referring to Stanley, as being the "Garden Spot of the World." He also sent an article to the Lincoln Times - you know history repeats itself, etc. 100 years later. We urge everyone to write down all the history they know, with availability to everyone, even if it has been written before, maybe some history will be found in some family with valuable interest that never had been written down before. Let's preserve our history that once was for our future generations. I have lived in an era that has had many changes and many inventions. Not everybody had radios till in the 1940's, then television took the day and now in the 1990's the computer world - has brought many facets of history to our finger tips. In 1960 a contest was held requesting that people submit their ideas for a motto for Stanley. The winning entrant was A friendly Place by Alfred Rhyne, a proper and fitting motto for this town. We wish to express our thanks to the many people who have written and shared any little bit of this history. We have compiled a book which includes many interesting stories that have related to us and that we feel many people will enjoy reading. Some of our citizens have lived interesting lives, traveled far and wide areas of the United States and the world, but if it is not shared with others it is lost history. More and more people are getting history oriented. Losing our landmarks, Stanley Depot (1980's), Stanley's old Presbyterian Church (1998) is two of which should have never been destroyed. Continue to make our town worthwhile without destroying what we now have - Our high school also was lost - Hopefully our town will never merge with Mt. Holly and come out one. Things of this nature is sad to think about. Get the full story of Stanley, North Carolina. 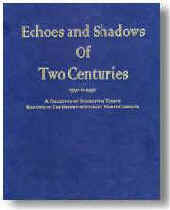 Order "Echoes and Shadows of Two Centuries." Five hundred pages of detailed information about Stanley, its history and its people! in any form without the written permission of the publisher. "If you don't recount your family history, it will be lost. Honor your own stories and tell them too. The tales may not seem very important, but they are what binds families and makes each of us who we are."